The Art of the Obituary These are the people you will wish you had known. Early in 1998, This is True author Randy Cassingham was distressed to see that not only had actor Jack Lord died, but that his death was virtually ignored in the mainstream media. Wanting to honor him somehow, Randy came up with the idea of an “honorary unsubscribe” — symbolically deleting Lord from the This is True online distribution list. (Randy had no way of knowing if Lord actually was a subscriber, since it’s virtually impossible to positively identify someone by their email address alone.) Reaction was immediate: True’s readers loved the honor, so now someone is honored almost every week in This is True’s email newsletter. But there’s no point in rehashing what everyone already knows about. 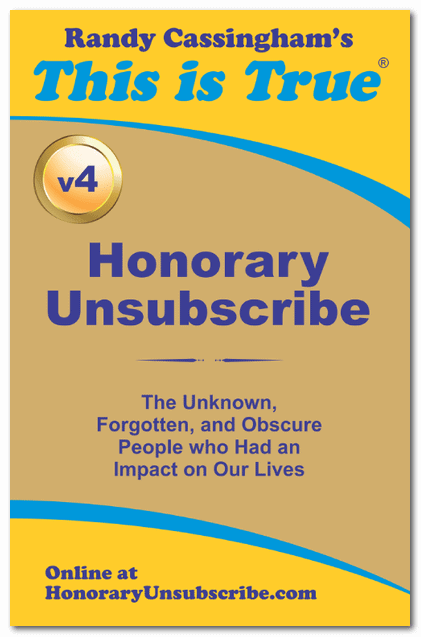 Rather than jump on bandwagons recognizing celebrities, the Honorary Unsubscribe is designed to “recognize the Unknown, the Forgotten and the Obscure People who had an impact on our lives.” So you will probably recognize few of the names, but you’ll come to understand the impact the honorees have had on your life. These are the people you will wish you had known! On the occasions that Randy does write about someone well-known, it’s usually because he has found an angle that most people don’t know about — or the person dropped out of the limelight and was forgotten. Obituaries are pretty much a lost art in America, and most people ignore them. Why? Because few can relate to the usually poorly-written paragraph that tries to sum up a person’s life. When Randy writes an “honorary unsubscription” notice, he makes it interesting as few writers can. When he skips a week here and there, readers complain that they miss reading about someone who made a difference to the world. The writeups for honorees from 1998 through 2009 have been published as ebooks, and are available on Kindle (including Kindle apps for your smartphone or computer) for just $3.99. The first book covers writeups from 1998 through 2000; the second book runs from 2001 through 2003; the third book includes 2004 through 2006, and the fourth book covers 2007 through 2009. The books are terrific. Start with the inventors: the same guy invented the computer hard drive and the video cassette, another guy vinyl — and bubble gum. Even the guy who created the Smiley Face (and why he didn’t get rich from it). And then there’s the artists, the creators of music and TV shows you love. Doctors who made radical breakthroughs to improve human life. Even a rocket scientist here and there, who helped humanity reach toward the stars. And, yes, an entertainer or two — the ones who spent their entire lives bringing us joy, only to die mostly forgotten. The mainstream media tend to worship celebrities and sports figures, but the real heroes in life are often anonymous to the public. You’ve likely never heard of the doctor known as “the fastest man on Earth” — but you’ve probably seen his photo, working as his own test dummy, risking his life to learn how to make cars (and spacecraft) safer. He’s in Volume 1. Their stories are fascinating: you won’t believe the cool people you have missed in your life. These are the people you’ll wish you had known. The popularity of the “Honorary Unsubscribe” feature in This is True led to a spinoff, HeroicStories, which began publication online on May 1, 1999. If you like the HUs, you’ll almost certainly love the HSs. Check them out right here.